Often when checking the low quality posts we come across answers which should have been comment on another answer or the question or just link in answer, and we flag them so. As the end of flag votes, usually in the link only answer and commentary on post cases we delete the answer altogether. I propose that we get an option to push it as a comment on the question, especially if it is flagged as link only answer so that the usefulness of the answer, however small, remains. For comments on another post, we don't know which post it's a comment for. Sometimes the answers are "that answer didn't work for me," so that's a potential problem. What about link-only answers that might be spam? Will there be a separate option for that? Otherwise I could see more spam sneaking into comments. 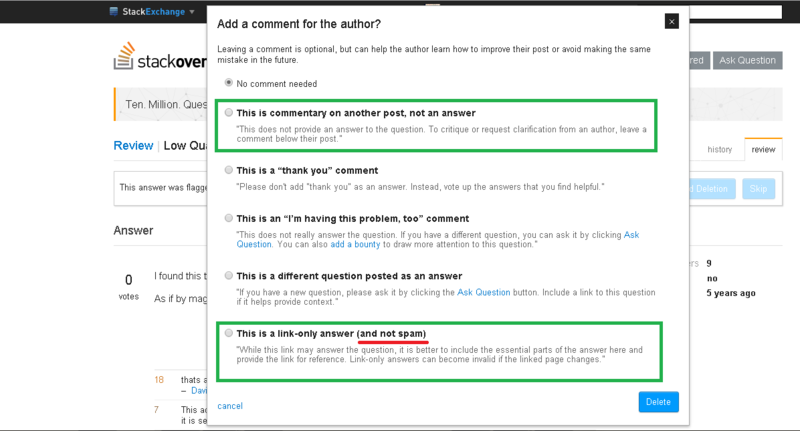 "Answers" that are overly long comments (over 600 characters) won't be able to be auto converted. Comments don't support as much formatting. So while your idea seems ok at first glance, I have some reservations on how this is all accomplished. Besides, comments are supposed to be even more prone to deletion than answers, so the useful content might very well disappear anyway. I'm going to address what I think are two somewhat different issues. The former two are preferable when the content is solid enough to warrant it. Attribution to the original poster is appropriate in all cases. Note that if you can't figure out which post it belongs with, then it's not well formed enough to preserve. Doing this manually avoids the fiddly problems mentioned by other users; you as a person doing it have the ability to apply your judgement in solving problems with formatting and length. As long as you attribute it and preserve the essence of the post you're deleting (and don't include problematic portions), I can't see any problem with doing this. There is a sort of problem here that requiring the work be done manually doesn't solve that you may be hoping to solve with this feature: it's not easy and so users will sometimes forego doing this work in favor of just deleting and moving on. I contend that these users shouldn't be trying to convert the content into a comment, anyway, since they are not willing to put forth the effort to determine the right course of action. These shouldn't be converted into comments. If the link is a valuable resource, just edit the answer to incorporate some of the link's relevant content or explain in detail how the resource is helpful. Then it becomes a good answer and you can choose not to delete it. If link doesn't contain any good content, just delete and move on. Proper reviewing is hard work, especially in the LQ queue. It's extremely uncommon that the best course of action is to simply click a button and move on. Usually, additional research is required, and often, some sort of work needs to be done outside of the queue to put things right. If you're not regularly opening questions outside the queue to look through them and get context before you make a determination anyway, you're probably doing it wrong. Should I downvote answers that just state that the code in the question works?